Stipe Miocic’s latest victim, Junior Dos Santos, will face the Cameroonian-French fighter Francis Ngannou at UFC 215. The event is scheduled to be held at Rogers Place in Edmonton, Alberta, Canada. 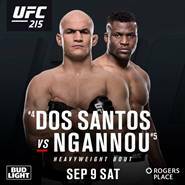 UFC 215 has managed to gather one of the most spectacular duels in the Heavyweight division with this Dos Santos-Ngannou matchup. At 33, Dos Santos is one of the most important Heavyweight fighters in history. The Brazilian owns an 18-5 record and for more than a year (2011-2012) held the title of heavyweight world champion. At UFC 211, held in Dallas, Texas, he lost to reigning world champion Stipe Miocic by TKO. Ngannou, nicknamed ‘The Predator’, is one of the most prolific fighters in MMA right now. He has a 10-1 record which includes six knockouts and four submissions. Ngannou was pushing for a fight against either Cain Velasquez or Dutch fighter Alistair Overeem, but instead he got another prominent name in Dos Santos. The African comes from winning his last fight against Andrei Arlovski via TKO in a flawless battle held on January 28, in Denver. Ngannou debuted in UFC on December 19, 2015, against Brazilian fighter Luis Henrique Barbosa de Oliveira with a KO win In Round 2. Since then, no one has been able to beat him. None of his fights have gone over the second round and all have finished either by submission, KO or TKO. Undoubtedly, this is one of the most important heavyweight combats of 2017. This fight was initially scheduled for August of this year, but was delayed because the Floyd Mayweather vs Conor McGregor fight was also scheduled for the same month. This is the third fight already on UFC 215’s card. The fights of Sweden’s Ilir Latifi (13-5) facing Australian Tyson Pedro (6-0) and Canadian Gavin Tucker (10-0) clashing with Rick Glen (19-4-1) had already been confirmed.